I was just talking about the cover reveal of Grey Sister by Mark Lawrence and--oh boy--when good things rain, they do pour a lot. Here I am, still enraptured by this stoked feeling and still overflowing with excitement, when the cover and synopsis for A Veil of Spears by Bradley P. Beaulieu is also unveiled. The said book is the third in The Song of the Shattered Sands series (and be prepared for books 4, 5, and 6 as well). This time seems to be a high time for publishing revelations! The synopsis has been posted earlier in some seller sites, but I am adding it below if you haven't read it yet... I am just wowed because I preordered these two books together (along with Obsidio by Amie Kaufman and Jay Kristoff). Is it just coincidence or what? This cover bursting with bright color somehow abated my dismay for the transition of designs between the first and second book. DAW has been known to do that to me and it is hurting my OCD. But if you would like to see the process on how this cover was made, you can read about it here. We should all thank Donato Giancola for this mouth-watering cover. 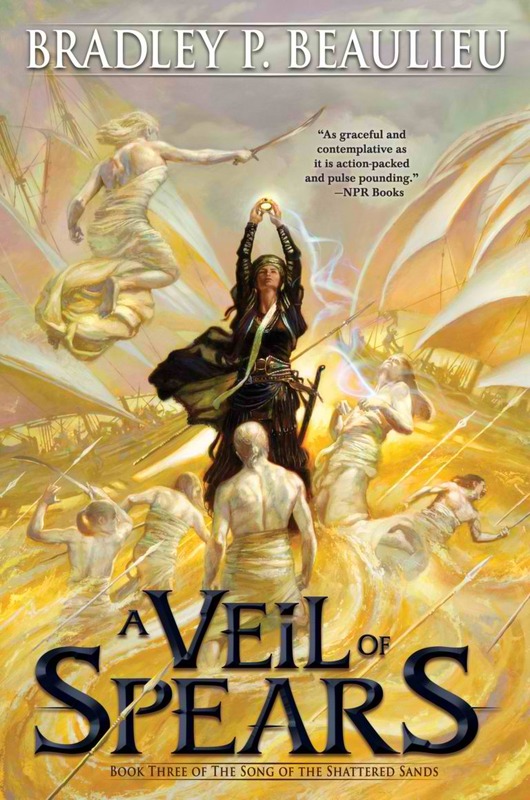 Check out the cover of A Veil of Spears by Bradley P. Beaulieu. The third book in The Song of Shattered Sands series--an epic fantasy with a desert setting, filled with rich worldbuilding and pulse-pounding action. Since the Night of Endless Swords, a bloody battle the Kings of Sharakhai narrowly won, the kings have been hounding the rebels known as the Moonless Host. Many have been forced to flee the city, including Çeda, who discovers that the King of Sloth is raising his army to challenge the other kings' rule. When Çeda finds the remaining members of the Moonless Host, now known as the thirteenth tribe, she sees a tenuous existence. Çeda hatches a plan to return to Sharakhai and free the asirim, the kings' powerful, immortal slaves. The kings, however, have sent their greatest tactician, the King of Swords, to bring Çeda to justice for her crimes. But the once-unified front of the kings is crumbling. The surviving kings vie quietly against one another, maneuvering for control over Sharakhai. Çeda hopes to use that to her advantage, but whom to trust? Any of them might betray her. As Çeda works to lift the shackles from the asirim and save the thirteenth tribe, the kings of Sharakhai, the scheming queen of Qaimir, the ruthless blood mage, Hamzakiir, and King of Swords all prepare for a grand clash that may decide the fate of all. A Veil of Spears by Bradley P. Beaulieu will be released on March 20, 2018.